Fully-loaded with modern, high-tech functions, the Casio Men's Amazon Exclusive Pathfinder Multi-Band Solar Atomic Digital Watch (PAW1500Y-1) is the ideal timepiece for the active man. With the case, bezel, and bracelet made of durable, black resin, this sporty watch also features easy-to-use, one-button push functions for an altimeter, barometer, and compass. The black dial displays a digital time and calendar display along with moon phase and tide graph. The eco-friendly watch is powered by solar energy so there's no need for a battery. Plus, it features Japanese quartz movement for accurate timekeeping and is water resistant to 660 feet (200 meters). 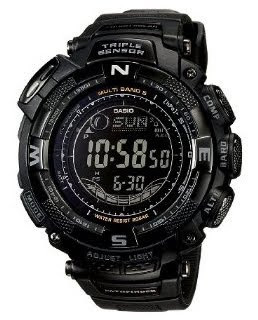 With a comfortable, resin bracelet with buckle and a scratch-resistant mineral window, the Casio Men's Amazon Exclusive Pathfinder Multi-Band Solar Atomic Digital Watch is perfect for the office or trekking through the Himalayas--and everywhere in between.